True to rumors, Sony revealed a new OLED TV tonight at CES. The display itself appears to be just as thin as LG’s new 2.5mm-thick OLED W7, but where the LG OLED puts the speakers in a giant soundbar you can position anywhere near the TV, the Sony set uses the display itself as the speaker. 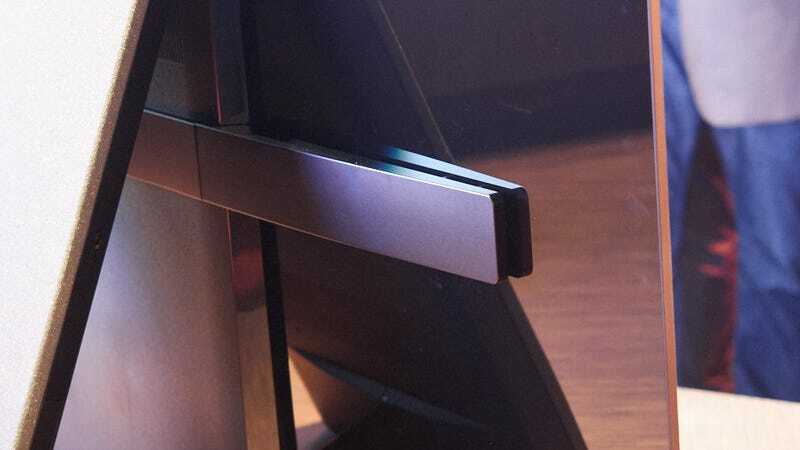 While the idea of making the display itself a speaker is a cool one, it also means you’re going to have some issues mounting Sony’s new Bravia XBR-A1E OLED on a wall. In order to make the display a speaker, Sony mounted two actuators to the back of the display. They vibrate the display (Sony claims you’ll see no vibration, even during extremely loud playback) to produce the sound. The rest of the guts of the TV, including all the inputs, have been offloaded to an enormous rear-facing subwoofer that doubles as the TV’s stand. This design choice is in line with what we’ve seen from LG and Samsung at CES—moving all the guts away from the super thin display. And it’s a gorgeous display, rendering images as complex as heated glass realistically. Sony says that it will also support all three of the current HDR formats: HDR10, Dolby Vision, and the new Hybrid Log Gamma. Sony’s new OLED will be available later this year in 55-inch, 65-inch, and 75-inch models. And as flagship televisions, you can expect to spend all of your money on them. Previous Sony flagships have started at well over $6000.